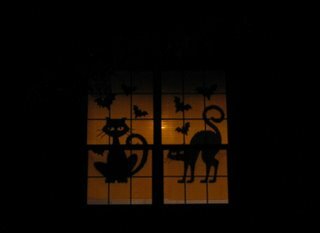 I have successfully put up my first Halloween decorations for the season, and I must say that I am happy with the results. This is what our Apartment windows looks like from the street. Awesome! You know, almost no one understands where the phrase "fish or cut bait" came from and what it is supposed to mean. By the way, nice window decor. lol, uh, ok. I always thought it meant to make a decision one way or another, but perhaps you could enlighten me. No, that's right. Choose to "fish" or "cut bait" (which is to cut the bait that the fisherman is going to fish with). Two equally important items/decisions. However, people use it to mean decide or quit. Sort of as a synonym phrase with another bathroom oriented phrase meaning do something or leave. They think the cut bait means to cut your line and quit fishing. Just another phrase that has modified out from its original intent.